Now it’s time for boomers to join the senior discount crowd. The final batch of baby boomers will reach age 50 by 2014. Those of us who have passed this milestone know exactly what happens the moment the odometer of life clicks to the half-century mark: an envelope arrives from AARP. Yet, AARP is unrelenting. Like a hair band guitar solo, they grab that note and repeat it until they beat you into submission. Once you get that first invitation, you can bet your sweet bippy more invitations will continue to arrive. Mister Boomer ignored the invite for many years. Uncertain about any group that would have him for a member, Mister B’s boomer values — now updated to read, “never trust anyone over fifty … make that sixty.. would you believe seventy…” held steadfast. Then friends and family got into the act and asked if he had joined. “No,” was the terse response, “I’m too young.” A harangue would inevitably ensue, the speaker relating the many benefits of membership. Actual adulterated photo illustration by Mister Boomer. Your discount mileage may vary. Not an offer or endorsement. Finally, Mister Boomer’s sister hit a nerve. She extolled the virtues of the AARP discount. Semantically different than a SENIOR discount, an AARP discount was for members. With a family trip pending, Mister B succumbed to the siren call of the discount. A few weeks later, the membership card arrived. Sooner than you can say, “Adam West is Batman,” the card delivered on its promises. WHAM! 15% off a car rental reservation; BAM! 20% off a hotel stay; then two weeks later, POW! 30% off eyeglasses! Mister B had saved enough in the first month to pay for the membership for at least another decade. By then, the “real” senior discount will kick in. Well, there is still a chance to “die young and stay pretty.” In the meantime, bring on the discounts! As our 70-million strong generation ages, we may very well break the back of the traditional senior discount. The Social Security eligibility age is now in play, so what’s to stop the senior discount from going the way of the one-hit wonder? If you’re like Mister Boomer, you may not be all that concerned with any organization. After all, when asked what we were rebelling against, didn’t we answer, “what you got?” Here, however, experience is the best teacher. 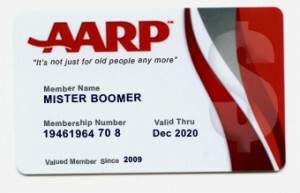 The next time that AARP invitation arrives, check it out. What do you think, boomers? Are you ready to save some moolah or do you already know that membership has its privileges?